Deal Shopping Mama: Toshiba 50" 4K Amazon Fire Smart TV $290! Toshiba 50" 4K Amazon Fire Smart TV $290! WOW! Great Deal On this TV!! 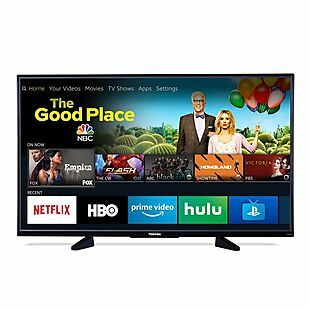 The Toshiba Fire TV Edition 55" 4K Smart TV with HDR drops from $399.99 to $289.99 when you checkout using an Amazon Prime account or sign up for a Prime free trial at Amazon. Plus the shipping is free. This TV is only sold at Amazon, but this is the first time it's gone on sale. It's also currently $10 less than the list price of the smaller 43" model. These TVs have an Amazon Fire built-in, and they come with an Alexa voice remote. Sales tax is charged in most states.